There’s a new king at the top of the mobile tree over at the Korean firm as the LG Optimus G Pro struts its stuff at MWC 2013. Taking over from the LG Optimus G, the Optimus G Pro was officially announced back in January but this is the first chance we’ve had to get hands on with the new flagship device. 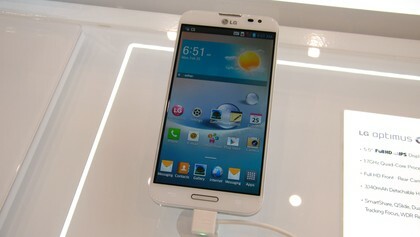 LG says the Optimus G Pro will be available in global markets, although it’s bad news for anyone living in the UK as the Korean firm has already confirmed it won’t be heading that way. The LG Optimus G Pro comes equipped with an excellent 5.5-inch full HD IPS display which delivers an eye popping 400ppi, meaning everything looks stunning. 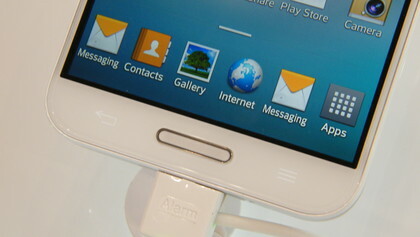 This puts the Optimus G Pro firmly in competition with the Samsung Galaxy Note 2, Huawei Ascend Mate and ZTE Grand Memo in the ever evolving phablet war. That screen is backed up by a beefy 1.7GHz quad-core processor and 2GB of RAM which sees Android Jelly Bean zip along at a rate of knots making for a pleasing and efficient user experience. 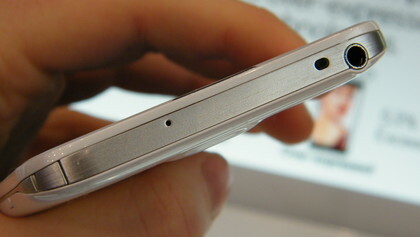 Thanks to that 5.5-inch display the Optimus G Pro is a pretty large device measuring 150.2 x 76.1 x 9.4 mm and weighing in at 160g. LG has taken steps to make it more manageable for one handed use with a slender bezel running down each side of the display helping you wrap your fingers round the device. 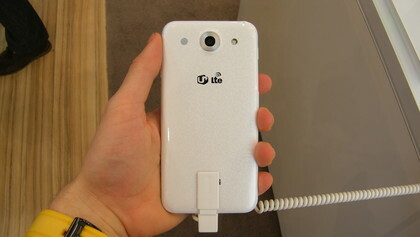 Something which detracts from the Optimus G Pro from a design perspective is the use of plastic, as we’re seeing premium handsets such as the iPhone 5, HTC One and Sony Xperia Z sporting classier materials these days. The gloss finish of the plastic also means that the Optimus G Pro is a pretty slippery customer in the hand offering up very little in the way of grip and we would be concerned about dropping this behemoth. It’s also tricky to hit the power/lock key on the right and the volume rocker and quick key buttons on the left side of the G Pro when holding it in one hand, and we found ourselves employing both mitts when it came to adjusting the volume or unlocking. 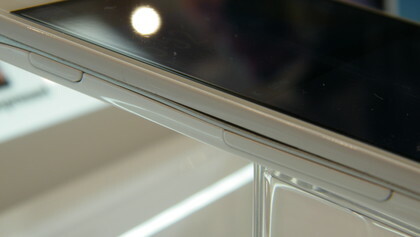 The responsive touchscreen meant we were able to merrily skip through homescreens and app list without issue and applications opened up almost immediately on the Optimus G Pro. LG has added a few touches as part of its Android overlay including quick settings toggles in the notification bar allowing you to easily control Wi-Fi, Bluetooth, GPS and NFC. 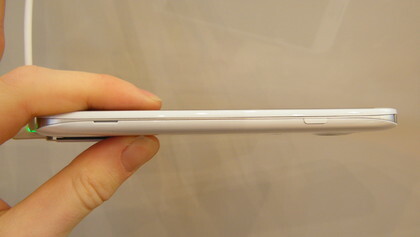 QSlide also makes an appearance on the LG Optimus G Pro, allowing you to have multiple applications open at the same time on the expansive 5.5-inch display, which is prefect it you need to read a document while replying to an email, or need make a quick calculation in the middle of a text message. Video playback on the Optimus G Pro is very impressive and HD movies look excellent on the large screen which also boasts decent viewing angles allowing your friends to huddle round and watch the action. 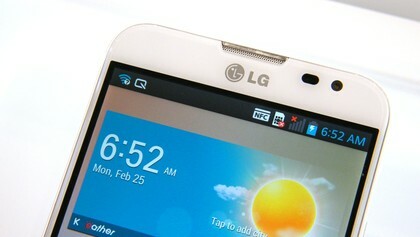 Battery fans will be pleased to hear that the LG Optimus G Pro comes with a removable 3,140mAh juice pack, which will be in high demand thanks to the HD screen and 4G network capabilities. 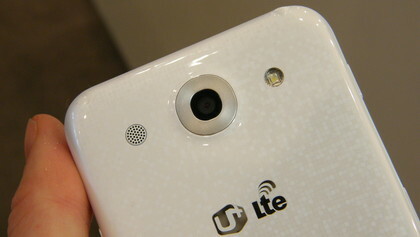 The Optimus G Pro is also blessed in the camera department boasting a 13MP lens and single LED flash on its rear, while round the front you get a 2.1MP camera for video calls and self portraits. As with the rest of the handset, shutter speed is rapid and there’s a decent range of modes and settings in the camera app to keep budding photographers busy. Google Chrome and the stock Android browser both make an appearance on the Optimus G Pro, offering up a slick, fast and visually impressive web experience which you can take on the road thanks to the LTE compatibility. 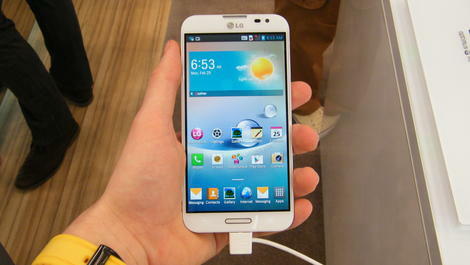 The Optimus G Pro is an impressive handset offering up super slick Android Jelly Bean and a top notch range of features. It gives the likes of the Galaxy Note 2 and Xperia Z some serious food for thought and it could go on to be a pretty decent success as LG looks to turn its ship around off the back of a successful Nexus 4 period.